Thousands of red abalone washed up on the Sonoma coast after a phytoplankton bloom turned the waters red—and toxic. Photo: loarie. About a month ago, thousands of abalone and other invertebrates washed up along the Sonoma coast, killed by what people thought was probably a red tide, a.k.a. a harmful algal bloom. Phytoplankton—photosynthetic organisms like algae and bacteria—can multiply in number, turning the water red with their bright-colored cells and wreaking havoc on marine organisms. An interdisciplinary team of researchers banded together to find out what was going on along the Sonoma coast. Within a few weeks, they’d figured it out: sure enough, it was a red tide. This was the first time a red tide had widespread impact on wildlife along the coast of California. From Bodega Bay to Salt Point, 50 miles north, invertebrates like abalone, urchins, and gumboot chitons were affected by the red tide. I talked with Laura Rogers-Bennett, Senior Biologist Specialist with the California Department of Fish and Game and the UC Davis Wildlife Health Center, who did surveys to quantify the extent of the damage. 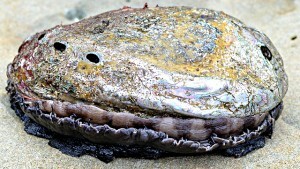 She and her colleagues surveyed several sites and found a lot of dead abalone. At Fort Ross, 30% of the abalone had died. At Salt Point, abalone mortality was 12%, and at Timber Cove, mortality was 25%. They took tissue samples from abalone and other invertebrates, and they conducted underwater surveys to look at the geographic distribution of affected organisms. Red tides can kill marine life in two ways. The first way is by depleting the oxygen in the water, during the algal bloom and during the subsequent die-off and decomposition of the phytoplankton. With low levels of oxygen in the water, marine life suffocates. Red tide events that kill through oxygen depletion have particular characteristics. They are usually small and localized—the size of a large living room, says Rogers-Bennett. They often occur in areas with very little water movement, like the back of coves, and they affect all the organisms in the area, including the fish, which either die or swim away. Recent underwater surveys indicated that this red tide was not killing via oxygen depletion. For one, the area affected was far larger than a living room. And the red tide affected organisms in multiple patches, some of which were in very exposed areas, not just the still backwaters of coves. Plus, the fish did not seem to be affected. Because of this evidence, scientists suspected the phytoplankton bloom was releasing a biotoxin. To identify the biotoxin, the researchers sent water and tissue samples to Rita Horner at the University of Washington and David Crane at Fish and Game’s Office of Spill Prevention and Response. They determined that the most abundant phytoplankton species was a dinoflagellate called Gonyaulax spinifera, which releases a toxin called a Yessotoxin. However, the dinoflagellate and the toxin are poorly understood, says Rogers-Bennett. Yessotoxin was present in very low amounts—about one part per billion—and we don’t know how much toxin must be present for an organism to suffer ill effects. So we don’t know for sure whether Gonyaulax spinifera and its Yessotoxin are responsible for the death of the invertebrates, or whether the true guilty party is some other, unidentified toxin. Rogers-Bennett and her colleagues are seeking funding to do additional tests of the Yessotoxin, its toxicity, and its effects on the invertebrates. Studying this red tide is a team effort, involving researchers from UC Davis, UC Santa Cruz, Sonoma State, the California Department of Public Health, and NOAA. Researchers have done bird surveys, which indicate that the toxin is not moving throughout the food web. And they’ve tested for toxins that affect humans, but thankfully none present. Next, researchers plan to look at archived satellite images of the red tide to see how it moved throughout the area, and they want to do more extensive subtidal surveys, to learn more about the geographic pattern of its effects. Because of the recent mass mortality of abalone, the Fish and Game closed the Sonoma abalone fishery in September. Normally, recreational abalone collectors can take abalone from the coast through November, but because the population took a big hit, it needs some time to recover. Rogers-Bennett hopes that the fishery and its managers will keep this in mind as the next abalone season approaches in April. The abalone fishery is not a commercial fishery; it is illegal to buy and sell abalone. There is now a new red tide off the Sonoma coast. This one, called Ceratium, is not toxic, but it is lending the water a brownish red hue. Recent conditions have been perfect for a red tide: calm water and abundant sunshine, thanks to fog-free days. The conditions preceding last month’s deadly red tide were similar. Globally, red tides are on the rise, because of warmer sea surface temperatures and an increase nutrient in coastal waters because of human activity. However, neither of these red tides is tied to warm surface waters or higher-than-usual nutrient input. The causes of these recent red tides remain a mystery. I am a trophy abalone hunter on the north coast of Sonoma County. I dive weekly along the coast, mostly at depths that exceed 15′. I have noticed the effects of this event, but they have been minimal, mostly affecting the sea urchin populations, which are in direct competition with the abalone populations for food and habitat. When urchins abound, the abalone population suffers. The effects of this event seem minimal at depths deeper than 15′. Abalone habitat extends down to depths below 40-50 feet. On my latest dives, the abalone population appeared to be thriving, showing no ill effects. The “mass die offs” appear to me to be isolated to a couple of specific sites. This type of event has occurred before and will occur again. It just wasn’t reported. Part of this is due to the fact that at the end of this red tide event an unusually large ocean swell came ashore which washed large quantities of the affected organisms onto the shore at one time causing all of the alarm and headlines in the media. In the past, the events have gone unnoticed by most except those who dive in this region on a regular basis. If you talk to those individuals, I think you will find their impressions are consistent with mine. Studying the phenomena is a good idea, but don’t create a crisis that doesn’t exist in order to obtain funding to do it… and don’t respond with draconian regulations before you understand the full scope of what is going on. This is a follow up to my original comment posted on this article that was critical of the response of closing the abalone fishery along the entire Sonoma Coast. I attended a progress report meeting (on the die off) held at the Bodega Bay Marine Lab at the invitation of Laura Rogers-Bennett, the Senior Biologist Specialist with the California Department of Fish and Game and the UC Davis Wildlife Health Center. I was very impressed with the effort she is leading in understanding the phenomena that generated the die off of invertebrate marine life along the Sonoma Coast. The effort she is leading and the manner in which she is pursuing the scientific investigation is very impressive and I am in total support of that effort. She has brought a lot of resources together from varying disciplines in a focused coordinated effort to understand this event in a very short time frame. Being an avid recreational free diver I am grateful for the scientific efforts being applied. The information obtained thus far has not answered most of the questions generated by this event, but it has answered some and eliminated others. I will leave it to the investigative parties to report on their findings as they are far more qualified than I. It is my hope that this effort will be adequately funded, as it should be. I may disagree with the regulatory response to the incident, both immediate and long term, however the need for more information is paramount. This event by itself, in my opinion, does not constitute a crisis demanding the regulatory response of the closure of 83 miles of shoreline to the abalone fishery. However, if it becomes a regular occurrence in these waters, the potential would indeed be catastrophic and possibly well beyond our ability to control or mitigate. The more information the better, sooner rather than later, and Laura Rogers-Bennett appears to me to be the best individual to lead that inquiry. Having said that, I also believe as I stated before the severity of the impact of this specific event was isolated to a few locations but overall, whatever caused it, it is evident that it was present over a very large area to a much lesser degree. In summary, let’s get to the bottom of it and gain a better understanding of what is happening before issuing mass closures of fisheries unless there is sufficient data to support the value of doing so, or there is a threat to humans from consumption. Ultimately that may be the prudent thing to do, but I don’t think it is yet. Time and time again I see the pattern of the people who have the right to take from nature and are angry and upset that all of a sudden out of the blue conservationists and environmentalist (some with actually degrees in science) make an impression with studies and observations and statistics to prove to our authorities who regulate environmental protection speak out and are able to stop hunting, harvesting, of our oceans and rivers in order to stabilize and study a concern for an obvious and dramatic event, such as these abalone showing up dead on the beach. What im trying to say here is that hunters of the abalone dont see the whole picture…they see the sea urchin population growing and they know that that population growth effects the abalone…but they dont see the big picture of why the red algae and the sea urchin population are abundant…all they see is the abalone dying !…They dont have the education nor the sweeping insight to see there is a human environmental pollution problem involved in this.